Ferdinand Magellan was a Portuguese nobleman and sailor who led the first European expedition to circumnavigate the globe. Born in Portugal, Magellan began serving as a page in the queen’s court at age 10. As an adult, Magellan became a naval officer, serving the king on an 8-year mission to lead the capture of the port in Malacca (modern-day Malaysia). Magellan also fought Egyptian ships for control of the Arabian Sea in the Battle of Diu. He may have also traveled to Indonesia, which was known as the “Spice Islands” at that time. The islands were famous for their precious spices, such as nutmeg. Magellan was stationed in Morocco when he was accused of illegally trading with African-Arab traders. He denied the allegations but was stripped of his authority and lost the king’s approval. Magellan re-established himself as a Spanish citizen in Seville, Spain, in 1517 and married a Portuguese woman named Beatriz Barbosa. The couple went on to have two sons. His wife’s family also introduced him to the court of King Charles I of Spain, a young king who was interested in discovering a direct trade route to the “Spice Islands” without having to sail through Portuguese-controlled waters. Inspired by Christopher Columbus’ western route, Magellan believed that he could circumnavigate the globe without having to sail around the coast of Africa. Charles agreed to finance the expedition. In 1519, Magellan’s fleet set sail with 270 men and five ships. They fared well across the Atlantic and anchored in Brazil. For five months, Magellan’s crew searched along the eastern coast of South America for a passage that would lead them through the continent rather than sailing around the southern Cape Horn. Tempers flared and mutiny ensued. One ship’s captain was killed, and another captain was executed by his crew. After finally locating the 350-mile-long waterway that is now called the “Strait of Magellan,” they discovered it was a navigational nightmare. Another of the fleet’s captains deserted, fleeing to Spain (and taking substantial supplies with him). Magellan and his fleet continued through the strait, emerging on the west coast of Chile. Magellan called the new ocean the “Pacific” for its calmness. Magellan and his crew assumed that the Spice Islands were nearby. They set sail across open water and then went without seeing land for over three months. They lost a significant number of men to scurvy, disease, and starvation. Eventually, they landed in Guam, then proceeded to Homonhon Island in the Philippines. He formed a friendship with the ruler, Rajah Humabon, and the rajah and his queen were baptized. Magellan demanded that all nearby islanders should be baptized as well, but a local chieftain, Lapu Lapu, refused. The rajah sent Magellan and his men to subdue the chieftain, and Magellan led them at the Battle of Mactan. Magellan was killed, and the Mactans destroyed his remains. 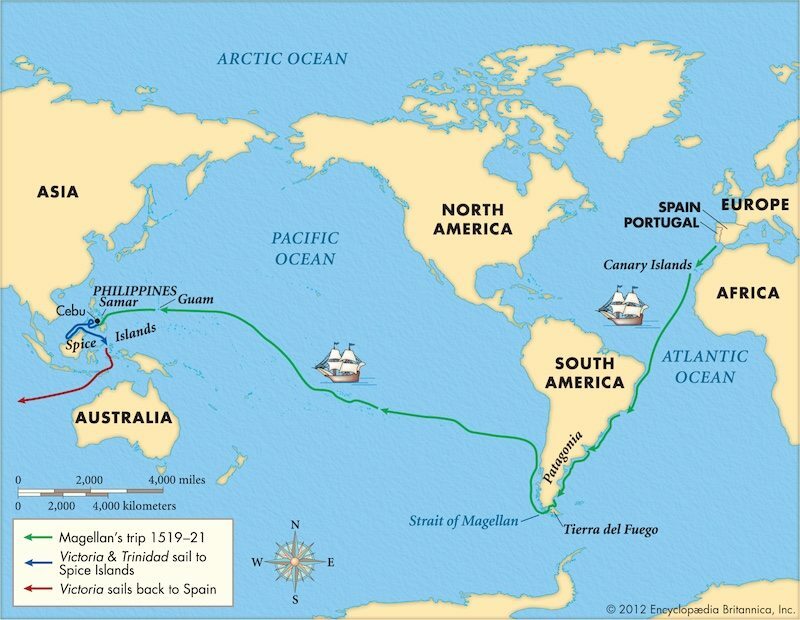 Although Magellan never completed his journey, his fleet continued without him. Another captain, Juan Sebastián de Elcano, was able to lead the remaining crew back to Spain. In total, the voyage lost three ships and over 200 sailors’ lives.